If I could go to Kindergarten . . . I love reading to the Ks at Seymour. I get to do it at least a few times a month at our primary Social Responsibility Gatherings. The Ks sit right up in front, eyes wide, serious expressions, taking it all in. They listen intently, little hands raise in the air to tell me connections and ideas. Then when they leave, they wave, they smile, they whisper, “I’ll miss you.” One of my favourite things to do is to read to the Kindergarten class. So I got to thinking what if I could go to Kindergarten everyday? And read? What would I read? During my last few visits to the public library I found some wonderful possibilities. Saber-toothed tigers. Wooly mammoths. Sleepy dinosaurs. A little boy exploring the world around him. 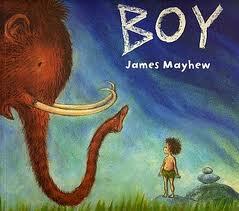 Boy by James Mayhew explores a little guy’s yearning for independence while at the same time honouring his deep connections to home (and the happy snuggles from Mom and Dad). Where in the world do we find warmth? In the security and love from our own family. A beautifully illustrated story inspired by the author’s love of his own son. Marie-Louise Fitzpatrick wrote There – as a series of questions. A story about growing up and celebrating the journey as much as the destination. When will I get there? How will I know? And will I know everything, There? The little girl then wonders Can I change my mind and go Elsewhere instead? She then decides that she will go There tomorrow – after she does all the things she needs to do. 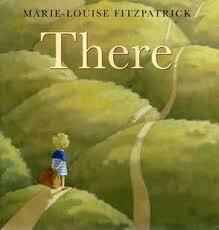 A book that begs to be explored with children. Winner of the Bistro Awards in 2010. 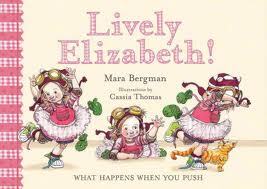 I think this book by Mara Bergman and illustrated by Cassia Thomas – Lively Elizabeth is especially appropriate for kindergarten. Life when you come to school is all of a sudden a lot about lining up. Going here, going there, hands to yourself, “shh!” Several times a day. What happens when you have a little extra energy and it kinda spills over into a push? Well in a kindergarten line, it is full on domino effect! Bergman does a lovely job of playing out the whole scenario – from upset to apology and then forgiveness and moving on (and quickly – after all, little ones have the important business of play to get back to)! Cassia Thomas’ illustrations are absolutely delightful! A book, I predict, that will get many “Read it again!” requests. Okay who doesn’t love surprises? And guessing what will happen next? Little ones do especially. 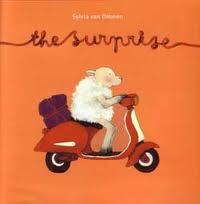 What a treasure is The Surprise by Sylvia van Ommen! Wordless so there is a lot of space for interactions. Predictions. Inferring. Questions. Sheep zips here and there on her moped on a mission. She dyes her wool, when it seems long enough, a brilliant red. Then she brings it to poodle who spins it into yarn. She then knits something special and wraps it up and delivers it to . . . Well, not going to spoil the surprise here but how fun would this be to do with a class of Ks? 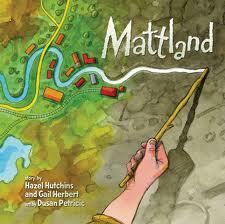 Mattland coauthored by Hazel Hutchins and Gail Herbert and illustrated by Dusan Petricic is a wonderful book to explore with children stressed by moving. The scary sadness of someplace new followed by the gentle, spontaneous introduction of new playmates and new activities. But this book is also ideal to celebrate imaginative, outdoor play. Building a place – roads, rivers, houses, prickly trees and getting some quiet help from someone with their own treasure trove of discoveries – a flattened penny, some popsicle sticks, four pine cones . . . To be fair, you can only read this book with intended outside play planned next. Lots of it. And it should probably involve some mud! Now I just need a plan to sneak in and share some of these with the Ks! This entry was posted in Uncategorized and tagged Cassia Thomas, Dusan Petricic, favourite illustrators, fiction, friendship, great read alouds, James mayhew, library books, making connections, Mara Bergman, Marie-Louise Fitzpatrick, picture books, reading to Ks, Sylvia van Ommen, wordless by carriegelson. Bookmark the permalink.